DIRECT occupants to the exit and out of the building. Inventor, Sonja Zozula woke in the middle of the night choking. When she was able to gain her senses, she realized the entire house was filled with smoke. It took everything she had to rouse her sleeping husband who was lethargic and disoriented. She was screaming “the house is on fire!” “Get the baby out of the crib and go out on the deck!” Her husband could barely function. Their four-year-old daughter was asleep in her bedroom downstairs. Sonja opened the patio door, took a deep breath and had the run of her life! For there was only one thing scarier than thinking she was going to die in a fire; it was thinking that her child would. She was exhausted and had fallen asleep with the baby bottles, pacifiers and teething toys boiling on the stove. Sadly, this type of event isn’t uncommon in America. For Sonja, it was when the nightmares began. The LinearStrobe™ devices are available in, both, single-station and system integrated forms. Either form provides the means of alerting occupants to the existence of an emergency condition, brightly demarking an exit or egress path and, directing occupants to the exits utilizing a flashing linear luminary. The typically preferred installation configurations are around an exit door or along pre-determined logical paths of egress from a building. LinearStrobe’s utilize a proprietary formula of silicone based adhesive or mounting clips to mount the device’s linear luminaries to the wall surface around a doorway. Model L-100 Single Station LinearStrobe™ (S-LinearStobes): Sound Activated, Battery-Operated, Modular for installation anywhere. Until your life depends on it. 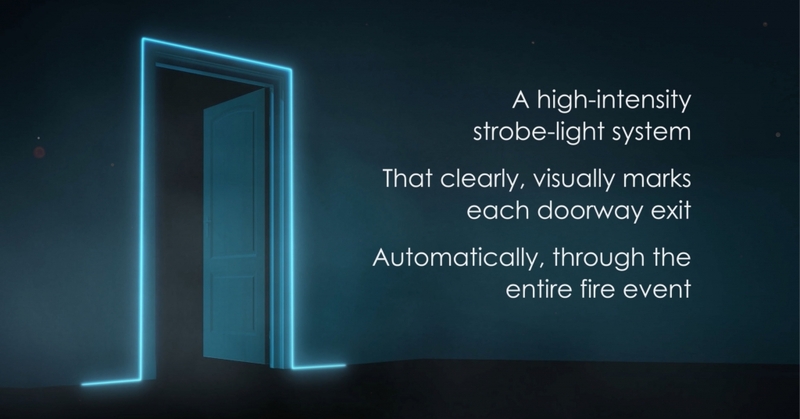 The LinearStrobe™ low-profile design uses a tiny clear wire around your door that takes on the color of its background and sits in the crevice where your door’s trim meets the wall. It’s only noticeable when activated by your smoke detector. This tiny wire may save you or your loved one’s lives.